An ethnobotanical survey was undertaken to record information on medicinal plants from traditional medical practitioners in Babungo and to identify the medicinal plants used for treating diseases. Traditional Medical Practitioners (TMP's) who were the main informants were interviewed using semi-structured questionnaires and open-ended conversations. Field trips were made to the sites where TMP's harvest plants. The survey identified and recorded 107 plants species from 54 plant families, 98 genera used for treating diseases in Babungo. The Asteraceae was the most represented plant family while herbs made up 57% of the total medicinal plants used. The leaf was the most commonly used plant part while concoction and decoction were the most common method of traditional drug preparation. Most medicinal plants (72%) are harvested from the wild and 45% of these have other non medicinal uses. Knowledge of the use of plants as medicines remains mostly with the older generation with few youth showing an interest. A divers number of plants species are used for treating different diseases in Babungo. In addition to their use as medicines, a large number of plants have other non medicinal uses. The youth should be encouraged to learn the traditional medicinal knowledge to preserve it from being lost with the older generation. Ethnobotany is the study of how modern and indigenous societies view and use plants . The use of natural products with healing properties is as old as human civilization and for a long time, minerals, animal and plant products were the main sources of drugs . The World Health Organization (WHO) defines traditional medicine as practices, knowledge and belief systems which uses minerals, plants and animal based remedies, spiritual therapies and exercises to prevent, treat and maintain well being . According to the WHO, about 80% of the population of the world depends on traditional medicine, mostly herbal remedies, for their primary health care needs . The African continent have a long history with the use of plants and in some African countries, up to 90% of the population rely on medicinal plants as a source of drugs . A medicinal plant is any plant, which in one or more of its organs contains active ingredients which can be used for therapeutic purposes or contain foundation compounds that can be used for the synthesis of useful drugs . The absence or inaccessibility of modern healthcare services, affordability, cultural acceptance and, under certain circumstances, effectiveness than their modern counterparts has caused a large percentage of the population to rely mostly on plant based traditional medicines for their primary health care needs. These factors and a growing interest in the use of natural products and folk medicine have resulted to an increase in the demand for medicinal plants . This increase in demand puts a threat on natural resources. Knowledge on the use of medicinal plants is enormous but if this is not rapidly researched and recorded, indications are that it will be lost with succeeding generations . An estimated 25% of prescription drugs and 11% of drugs considered essential by the WHO are derived from plants and a large number of synthetic drugs are obtained from precursor compounds originating from plants . Therefore the documentation of the traditional therapeutic know-how could lead to the discovery of new drugs as well as contribute to the conservation, sustainable management and use of plant resources. Ethnobotanical investigations have been reported for parts of Cameroon [8–10] and parts of the adjacent Bamenda highlands  but no investigation has ever been carried out in Babungo. It is therefore necessary to carry out a survey to document the plants used for medicinal purposes in Babungo. The study was carried out in Babungo, located in the Ngoketunjia division of the Northwest Region of the Republic of Cameroon. Babungo falls between latitude 6° 01' and 6° 11' N and between longitudes 10° 20' and 10° 29' E  as shown in figure 1. The soil type is sandy clay ferruginous soil and the average altitude is 1200 m above sea level . There are two seasons; the dry season from November to March and the rainy season from April to October. Annual precipitation is 2300 mm. Situated in the Sudan savannah, it is mostly covered with Helictotrichon maitlandii C.E Hubbard, Andropogon gayanus Kunth and Pennisetum purpureum . Common tree species include Cola spp., Spathodea campanulata P. Beauv., Markhamia lutea (Benth) K. Schum., Canarium schweinfurthii Engl. and Elaeis guinensis Jacq . The population, of about 14,000 inhabitants, are mostly peasant farmers who grow corn for subsistence and rice and coffee as cash crops. Blacksmithing and wood carving are also common occupations. 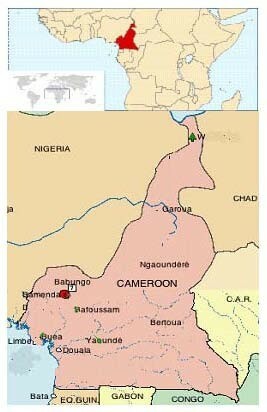 Location of Babungo in Cameroon . Traditional Medical Practitioners (TMP's) were the main informants in the survey. They were identified with the help of the traditional ruler and some of the elders of the tribe. A total of 17 TMP's were interviewed amongst whom 7 were literate. Their ages range from 28 to 70 years with more of them in the older side of the range. Most of the informants were men with only 4 females. After seeking their consent, the traditional medical practitioners were interviewed using semi-structure questionnaires and open-ended conversations. Trips were made to the sites where TMP's normally go to harvest plants and during such trips, there were discussions with the TMP's in addition to the interviews using the semi-structure questionnaires. The interviews and discussions were carried out in the local language since the author is a native speaker of the language. Data on the local names of the plants, the plant parts used, diseases treated by the plants, mode of usage and administration were collected in the field. Health conditions which were not recognized by the author were identified by the health professional at the health centre in Babungo. Plants recorded in the results were mentioned by at least two TMP's as treating the same disease in order to confirm its use. Fertile specimens of the plants were collected in the field using standard botanic methods  together with the TMP's. The collected specimens were identified at the National Herbarium in Yaoundé, Cameroon and voucher specimens were deposited at the herbarium of the Limbe Botanic Garden, Cameroon. A total of 107 medicinal plant species from 98 genera and 54 families used for treating about 55 health problems were identified in the survey (see additional file 1). The most represented plant family in the list of medicinal plants is the Asteraceae with 12.1% of the medicinal plants species followed by Lamiaceae and Poaceae with 5.6% each. Herbs made up 57% of the total number of medicinal plants followed by trees (24%), shrubs (15%), and climbers making up the remaining 4%. The leaves were the most commonly used plant part followed by the aerial parts of herbs (8%) and then by the bark (7%) of woody plants. The roots (6%), the flowers (5%), the fruits (4%) and latex (4%) are also used medicinally while the whole plant is the least used (3%). Many plants (51.4%) have multiple medicinal uses and many diseases are treated using a combination of more than one plant (Additional file 1). For example venereal diseases are treated by oral administration of a concoction of the roots of Capsicum frustescens, Vernonia amygdalina, C. schweinfurthii and the bracts of Musa paradisciaca. For some species, the same part is used to treat different diseases. For example the leaves of Carica papaya are used for treating malaria and gastritis. C. papaya, Eucalyptus spp., Mangifera indica and Psidium guajava do not have names in the local language and so their English names are used. Some plants from the Asteraceae family (Ageratum conyzoides, Crassocephalum rubens, Dichrocephalla integrifolia, Erygerum floribundus and Vernonia calvoana) are commonly called ndobovensi which translates to the devil's cigarette. Decoctions were the most common method of preparation and most of the medicines are administered orally with topical administration in the case of skin diseases or wounds. The most commonly known and used plants are Aspilia africana to treat wounds, Celosia globosa to treat athlete's feet, Cymbopogon citratus for fevers and Ocimum gratissimum for stomachache. Medicinal plants were harvested from the wild, from farms and fallows and some home gardens. From the list of medicinal plants (Additional file 1), 8.4% are cultivated exclusively for medicinal purposes (table 1), 19.6% are domesticated crops and fruits from farms, fallows or grown in compounds (table 2) and 72% are collected entirely from the wild. Forty five percent of medicinal plants (Additional file 1) have other non-medicinal uses as shown in table 3. For example wood from Bersama abyssinica, C. schweinfurthii, Cordia platythyrsa, Croton macrostachus are used for building houses, tool handles and furniture while Annanas comosus, C. papaya, Citrus aurantium, M. indica and P. guajava are common edible fruits. Plants cultivated solely for their medicinal uses. A list of domesticated crops and fruits used for medicinal purposes. Raphia hookeri Man & Wendl. Non medicinal uses of medicinal plants in Babungo. Used for driving away evil spirits. Eaten as a leaf vegetable. Whole plant is burn to repel insects. The juice from the leaves is used to remove stains. The latex is burnt to drive away evil spirits. The fruits are edible and the wood is used as timber. The fruits are added to food. The fruit juice is added to some herbal teas. The seeds are served to guest to chew. The wood is used for carving. The wood is used for carving, fuel wood and for tool handles. The leaves are used for tea. The fruits used for making palm oil and the kernels for palm kernel oil. Palm wine is tapped from the tree. The leaves are used for fodder. The wood is used for construction, furniture and for making xylophones. The leaves are used to scrub and clean kitchen utensils. The leaves are used as toilet tissue in the bush. The wood is used for construction and tool handles. The fruit pulp is eaten. Provides shade. The wood is used for tool handles and carving. The ripe fruits are eaten. The dried leaves are smoked. A decoction of the leaves is used to bath children who cry at night. The plant serves as insect repellent. The wood is used for construction. The wood is used for making xylophones. The wood is used for construction and for tool handles. Raphia hookeri G.Mann & H.Wendl. Sap from the palm is drunk as wine. The seeds are used in the production of castor oil. The wood is used for firewood and for making drums. The wood is used for building houses. The seeds have a commercial Value. The grains are the main staple food. Prunus africana was reported by the TMP's to be extinct from the wild. A few stands of dead P. africana trees were seen during the field survey. Existing trees are found in private gardens and in some compounds. Most of the TMP's were above 45 years old with only one less than 30 years old. Thus knowledge of the use of plants to treat diseases remains mostly with the older generation. More plants from the family Asteraceae are used for medicinal purposes compared to any other plant family in Babungo because they contain a wide range of biologically active compounds and also because being one of the largest families in the plant kingdom, a large number of plants belong to this family [15, 16]. The popularity of herbs in traditional medicine has been linked to their higher likelihood of containing pharmacologically active compounds compared to woody plant forms . This may explain why more than half the plants recorded in the survey are herbs. Babungo is located in the grassland savannah which favours the growth of herbs. Most societies and cultures have a sound knowledge of the biodiversity in their environments as a result of long term experimentation and innovation . This may explain the use of many herbs in the traditional medicinal practice in Babungo. Leaves of plants have been reported to accumulate, inulins, tannins and other alkaloids  which may be responsible for their medicinal properties, explaining its wide use. Other studies reported the leaves as the most widely used plant parts [[10, 11], and ]. Aloe vera is used to treat malaria, gastritis, stomach ache, wounds and skin diseases, Spilanthes filicaulis is used to treat toothache, stomach ache, gastritis and malaria, Lactuca capensis is used to treat malaria, hypertension and gastritis. This may be because some plants contain many secondary metabolites which could have different pharmacological activities and consequently treat different diseases. The TMP's believe that combining more than one plant re-enforces the medicines, increasing their effectiveness. Similar findings have been reported in Ethiopia . Pharmacological studies supported this believe . However the same study reported that combining some drugs could have antagonistic effects. A. africana has been found to contain phytochemicals which are capable of arresting wound bleeding, preventing the growth of wound contaminating microbes and accelerating wound healing . Similar phytochemical analyses have been made for C. citratus  and O. gratissimum  and they were found to contain chemicals which relieve fevers and stomach ache respectively. This scientifically validates their common use for these purposes in Babungo. The fact that many medicinal plants have other uses may lead to their over exploitation, threatening their continuous survival in the area. Not many medicinal plants were cultivated solely for their medicinal values. This is because most people will prefer to cultivate food or cash crops rather than medicinal plants since most medicinal plants are either not sold or sell at very low prices and therefore not profitable, providing very little incentives for their cultivation. Some exotic species do not have names in the local language and were called by their English names. This is because these are recently introduced species in the area. In some cases, the names of plants in the local language were descriptive of some character of the plant; S. filicaulis called nyantanyui literally translating to God's pepper because of its pepper-like tasting flowers. The grouping of the some Asteraceae under one common name could reflect the local system of plant classification. The use of the bark of P. africana in the local traditional medicine and exploitation for commercial purposes has resulted to the extinction of the species from the wild. The bark was harvested and sold to Plantecam, a company which exported the bark or its processed extracts to Europe for manufacture of drugs used to treat benign prostatic hyperplasia sold under the brand name "Tadenan" (France) or "Pygenil" (Italy) . P africana has been listed by the International Union for the Conservation of Nature (IUCN) on its redlist of threatened species  for which conservation action must be taken. Many of the medicinal plants used in Babungo have been reported in other areas with similar or different uses; 12 species were found to be used in the Mount Cameroon area , 17 species are used in the neighbouring Fundong subdivion  and 19 species in Aguambu . One species, Vernonia calvoana, has been cited as a new entrant in the list of medicinal plants in Cameroon . Four species were listed in Kenya  while 3 and 13 species were documented in the mid-west and south-east of Ethiopia respectively [20, 28]. The use of medicinal plants across cultures and wider geographic regions has been discussed as prove validating their medicinal properties . The chemical composition of some of the plants reported in this study has been scientifically studied. The root of Rauvolfia vomitoria, used traditionally for high blood pressure, has been found to contain reserpine which lowers the blood pressure and slows down the heartbeat while the flowers of S. filicaulis were found to contain spilanthol a local anaesthetics . The seeds if C. acuminate has been reported to contain 2.5% caffeine, which is known to stimulate the central nervous system . This explains why cola nuts are chewed as a stimulant by the people of Babungo. Most young people are not interested in traditional medical practice because it is less profitable compared to growing cash crops. The influence of western culture, rural-urban migration in search for better educational and job opportunities and the commonly held view by young people that traditional medicine is superstitious and something for the poor and uneducated may result to a loss of this rich and useful knowledge which has accumulated over several generations. The survey shows that a large number of medicinal plants are used in Babungo for treating different ailments. The knowledge of the use of plants to treat diseases has been with the people for generations but has not been recorded. This knowledge remains mostly with the traditional medical practitioners who are mostly old people. Most of the medicinal plants are sourced from the wild. In addition to their medicinal uses, some of these plants have other uses. The local population should be educated on sustainable methods of harvesting plants to treat diseases today without compromising their availability for future use. The youth should also be encouraged to learn the traditional medicinal knowledge to preserve it from being lost with the older generation. I wish to thank the Traditional Medical Practitioners in Babungo for serving as key informants for this study. Athanasia Mbah-Fongkimeh of the University of Buea, Cameroon is also acknowledged for reviewing the questionnaire and making suggestions. I am also grateful for the contribution made by Linda Koye, the health professional at the Babungo health centre, who identified some of the diseases. My thanks also go to Dr. Sylvestre Njomo Njako and Sebastiaan De Smedt of the University of Antwerp for reading through the manuscripts. I like to express my gratitude to two anonymous reviewers whose comments and positive criticisms helped to improve the manuscripts. Being the sole author, DJS initiated the idea, developed the questionnaire, carried out the survey and wrote the article.